Staying hydrated is not as easy as drinking water whenever we’re thirsty. If it were, most of us would always be at the perfect level of hydration. While a good rule of thumb is to drink eight ounces of water, eight times per day, it also depends on your body weight, gender, level of exercise, where you live, and other dehydrating factors. This means each of us should adjust how much we drink every day based on our unique situations. We recommend downloading one of these awesome hydration reminder apps. A “smart water bottle” that reminds you to drink can be very helpful. Studies have shown that water can improve our cognitive functioning, keeping us more focused and alert. Combined with exercise, the right hydration does wonders for keeping our focus high and our energy up. Try having a glass of water right when you wake up in the morning. The instant pep of energy and nourishment may have you rethinking coffee or teas. In fact, most teas (and all coffee) dehydrate, which can lead to fatigue and slower brain functioning once the caffeine wears off. Keep it to water, stay on your toes! Somewhat ironically, remembering to drink can boost memory as well. The more you remind yourself to drink, the more easily you’ll be able to recall other things throughout the day. Even when you know that thirst can feel like hunger, you can still make the mistake of reaching for a snack rather than a bottle of water. That’s why it’s recommended that dieters actively increase how much water they drink. Combine that with increased energy — and decreased fatigue — and water ends up playing a massive role in getting to our desired weight. Incredibly, dehydration can even raise our cholesterol. So, while drinking more water won’t necessarily decrease cholesterol, it will help prevent our bodies from producing more. A lack of hydration makes it far more difficult for our bodies to flush out and filters wastes. 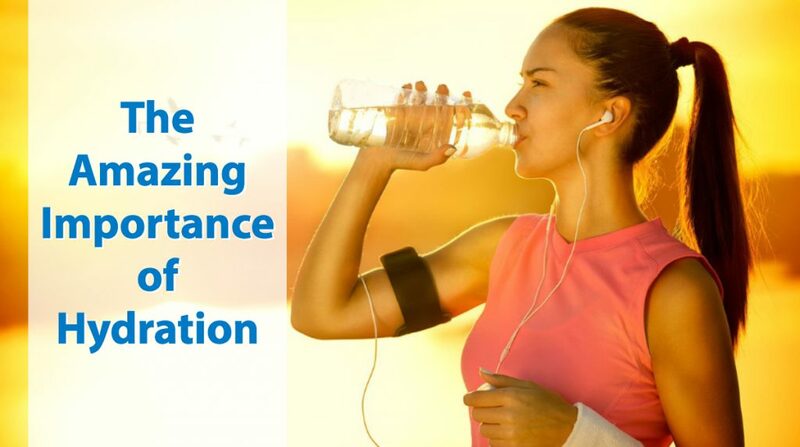 Staying hydrated also optimizes how our nutrients are transported. Imagine eating something because of its health benefits – only for your body to absorb a smaller portion of the vitamins simply due to dehydration! Water has even been shown to reduce inflammation, and it can boost the health of our joint cartilage. So much so, some experts believe hydration might be the biggest preventer of rheumatoid arthritis. Side effects of dehydration include headaches, which can be a major stressor. Even being hydrated “enough” but not entirely can bring down our moods significantly. Drinking water can also help lower blood pressure by promoting circulation, which is a huge stress reliever. At the same time, not drinking enough water can lead to higher blood pressure. In a related sense, our body is made up of about 60% water. Almost three-quarters of the brain is made up of water, and the same is true for the heart. Our lungs are made up of an incredible 83% water! Knowing these figures alone should be enough of a motivator to get our hydration on. Making sure you’re hydrated is most often felt – but it can also be seen. Hydrating has been shown to stimulate skin elasticity, which decreases wrinkle visibility. Not drinking enough water will also make your skin dry, flakey, and irritated. By simply drinking more water, you can moisturize your skin naturally. Skin is the body’s largest organ, after all! Also, when you don’t drink enough water, your body might try to moisturize your skin itself…which is when oil is produced. Acne anyone? No thank you! All the above reasons are equally important. Therefore, when we strategize our hydration, we can both bolster our overall wellness while avoiding complications. To ensure the best hydration, we need to address our individual lifestyles. But as you’ve certainly gathered, it’s incredibly worth it!